Here is the lucky thirteenth edition of our weekly report of pop from around the globe. The point of the Midnight World Pop Scout posts isn't reviews or analysis, it is to alert you to music of which you may not be aware. Selebrities are a three piece from Brooklyn that plays 80s style New Wave pop music with a dash of gothy darkness. The members are Maria Usbeck (Vocals/synth), Jer Robert Paulin (Guitar(s)/synth), and Max Peterson (production, drums, synth, synth bass). Can't Make Up My Mind from Selebrities on Vimeo. London-based Tiger Love consists of Roy, Gigi and Loral. According to their Facebook page, Roy and Gigi are brothers who grew up in New York, and Loral is the "underage" drummer. Their sound will remind you of the '80s, but in a good way. It is a delightful mix of synths, beats, engaging tunes and dirty lyrics. Our third offering today is Swiss indie pop from And Her Name is Violet. The members of the band are Carlo Caduff, who is the drummer, and multi-instrumentalist Hannes Barfus. There is little out there to buy, but they make a free song available on their website, and an EP is available on German iTunes. Have liked this band since I first discovered them on Daytrotter several years ago. Of course, it's Centro-matic related, somebody had kindly pointed me to Will Johnson's Daytrotter session and the Donkeys one caught my eye for some reason... Really liked the song "Come On Virginia" the first time I heard it, and wanted to hear some more. Slacker psych is how I would describe it, but please don't let that put you off if you take "slacker" as a pejorative... give them a try. These guys can really play, they just aren't in a hurry. Really looking forward to getting my hands on this record. 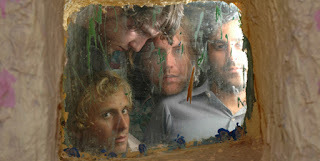 Don't Know Who We Are by The Donkeys from Secretly Jag on Vimeo. Perhaps my favorite garage band of the 60s is the iconic Pacific Northwest group known as The Sonics. The Sonics were characterized by the ferocious fuzzy garage rock sound, led by guitarist Larry Parypa, and Gerry Roslie's screaming vocals. The group was founded in Tacoma, Washington in 1960 by Parypa, originally playing R&B, and survived various line up changes. The group eventually solidified when Roslie and several others joined from another local band. Roslie's voice easily transitioned into soul and R&B numbers, and The Sonics albums contains several tracks in that style, including some very nice covers. While that isn't the version of The Sonics that carries their reputation to the present day, I've included one of their torch song covers from the 1966 LP Boom. In my mind, no discussion of The Sonics is complete without a reference to their version of one of the Pacific Northwest's most famous rock songs -- "Louie Louie". Led by Roslie's vocal performance, The Sonics turn the barroom sing along into an anguished love song. The Sonics have been cited as an influence by many following bands in the garage and grunge genres. They have reunited in various combinations from time to time for gigs, and in 2010 the group recorded four new tracks. I am rushing out of town and have little time to write. So I've selected a singer and song that need no introduction or contextual explanation. Wow, this is some amazing live footage! This video deserves its 3.2 million views. Cool Video Thursday (and new discovery): Jonny with "Candyfloss"
The band just released an album, also named Jonny, on the Merge label. Other players on the album include Dave McGowan of Teenage Fanclub and Stuart Kidd (formerly of the BMX Bandits, which included Blake) helping out on bass and drums. It was recorded by ex-Delgado Paul Savage at the Chem 19 studio, which is beginning to be a touchstone of albums I've liked lately. If you like clever wordplay and are a fan of the Teenage Fanclub, I suggest you give it a try. And speaking of giving it a try, you can stream the entire album on the Merge page linked HERE. I've listened to it and it is a quality album. To be honest, I'm actually on my second time through the album. I think this one could be a contender for a year end list. The Lucid Dream: "Love in My Veins"
They've kept company with Brian Jonestown Massacre on a British psych compilation and toured with another good band I've featured on here recently, The Crocodiles. Good stuff, looking forward to hearing more. You can listen to several songs at their Soundcloud and Myspace pages (links below). In today's edition we'll mention some notable upcoming albums and showcase some singles from those releases. Glasgow's Sons and Daughters are releasing their new LP, Mirror Mirror in June, as well. The band has been working at tweaking their hard hitting style with a bit of electronics, and I'm expecting a great album from this Rocksteady74 favorite. Below are two tracks and the promotional trailer for the album. We discussed Edinburgh School for the Deaf in April (refresher view here). The band is releasing their debut LP of death jangle, New Youth Bible, in June. You can listen to the just released single below. A band we've profiled in March, SHe's HiT, will be releasing their first LP in June. We intend to review the album closer to its launch. For readers who need or want to refresh their memories, you can review our previous discussion of SHe's HiT here, and the video for their new single here. Merge Records announces a new Buckner record in August. It's been a while (since Meadow in 2006), but his records are worth the wait. Here's an older video, actually one of those amazing moments you wish you'd seen in person... and if you did, you'd be telling your friends about it until they got sick of hearing about it. Some days one can wander around the internet looking for new and interesting music and realize that you've accomplished little other than avoiding that long list of spring yard duties that normal people think need to be accomplished. But some days yield exciting discoveries. And the best days yield exciting free discoveries. Today brings you two bands with a lo-fi approach to pop music, and they have made EPs available for downloading at the Bandcamp links I've provided. The first free EP is Vacation from the New Brunswick, New Jersey group Honeydrum. If you look closely at their Bandcamp page, you'll notice two additional EPs available for free download. That's nine songs, and they are good songs. Honeydrum - Shy Boy from Behind the Walk-in on Vimeo. Honeydrum - Romper Stomp from honeydrum on Vimeo. Honeydrum records on the Amdiscs label. Check out the Tumblr link below to view their multiple releases with some videos. The second generously provided release is the We Are Losers EP from the Irish band We Are Losers. The members of We Are Losers are Gavin Elsted, Gary Clarke, Bronwyn Murphy-White and Steve Colan, and they are signed to the Ghost Planet label. Kasey Anderson sheds his alt.country/singer-songwriter shackles to let 'er rip on his latest CD Heart of a Dog (Red River Records). It's pure rock'n'roll, a joyride, though still rooted in Anderson's well told, well crafted songs. The record closes with a blistering bar band cover of the English Beat classic "Save It For Later". Picture Bruce and The E Street Band ripping through it at the end of a third encore on a night they are really feeling it. This blog has been a tireless supporter of The Drive-By Truckers and Centro-Matic. Fans of both those bands are going to like this record a whole lot and should seek it out. The title of the record is taken from a Mikhail Bulgakov novella, which Anderson says contains a passage that sums up the soul of this record for him: "By kindness. The only method possible in dealing with other living creatrues. By terror you cannot get anywhere with an animal, no matter what its stage of development. I've always asserted this, I assert it today, and I shall go on asserting it. They are wrong thinking that terror will help them."